Having spent a summer studying in Ireland many moons ago where I got a taste of authentic Irish hospitality and hearty traditional food, I wasn’t surprised to find that same level of warmth and delicious Irish fare flying Aer Lingus from Seattle to Dublin. As an Alaska Airlines Global Partner letting Mileage Plan members earn miles, Aer Lingus is an ideal choice when flying to Ireland. From the friendly and attentive cabin crew, to the excellent meal and drink options and, above all else, the comfortable and spacious business class seats that convert to lie-flat beds, it’s clear why Aer Lingus is a leader in business class travel. Here are just a few reasons why I consider Aer Lingus business class to be one of my best air travel experiences to-date. 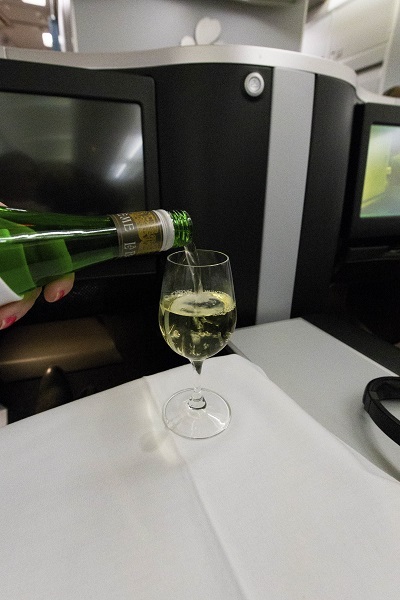 Aer Lingus business class guests are welcomed with a glass of La Bohème Act One Riesling. From the moment I boarded both the outbound and return flights, the cabin crew was the embodiment of first-class service. Prior to take-off, we were offered juice, champagne or a signature Irish cocktail. Once in the air, the flight attendants were quick to notice if my glass was empty and promptly topped off my drink. Shortly after take-off, we were offered free WiFi vouchers for 400MB of data (and so began the dilemma deciding whether to surf the Web, watch one of a large selection of blockbuster movies or get a good night’s sleep). On the return flight, while flying over Iceland, the captain encouraged all the passengers to stand and look out the windows to view one of Iceland’s spectacular volcanoes, Eyjafjallajökull. I’ve seen the volcano from the ground, but it’s an even more impressive view from about 30,000 feet above. Alerting the passengers to spectacular views was a nice touch on the captain’s part. Ireland is also the only country in Europe to offer U.S. pre-clearance. All Aer Lingus flights to the U.S. pre-clear U.S. Immigration and Customs in Dublin, which enables guests to save time on arrival, the ultimate time-saving service! 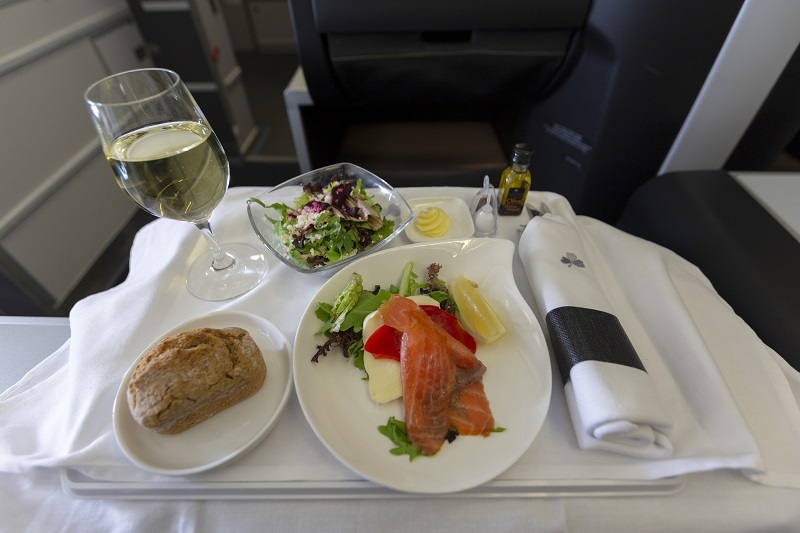 An Aer Lingus business class meal featuring smoked salmon. Just as the Irish love to (over) feed you on the ground, Aer Lingus business class demands that you come with a hearty appetite! First canapes, then a starter, main course, dessert … and after dessert? A small container of ice cream if you have any room left in your stomach. On the menu, Aer Lingus does a good job offering Irish-inspired food with a modern twist, featuring freshly sourced ingredients from all over Ireland. While touring the country, I stayed in Lisdoonvarna for two nights where I ate the best smoked salmon I’ve ever tasted at the Burren Smokehouse. You can imagine how excited I was when I saw it listed on the menu as a starter paired with Toons Bridge Mozzarella and roasted red pepper! I couldn’t tell you how breakfast tasted because I was sleeping so soundly that I slept right through it on both flights. On the return flight, I awoke shortly before beginning our descent, but the flight attendant was kind enough to offer me coffee or tea and a warm scone just 30 minutes before we landed. I can’t remember ever feeling so satisfied and refreshed getting off a red-eye long-haul flight. 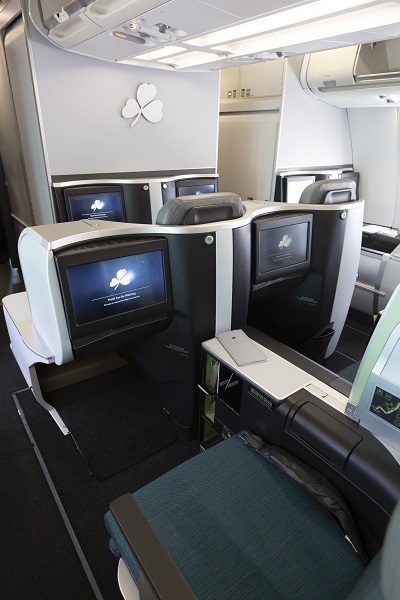 Aer Lingus business class features lie-flat seats, 16-inch touchscreen TVs and ample legroom. While the attentive cabin crew and high-quality meal options were a big part of my overall flight experience, the highlight was the comfortable seat that transformed into a lie-flat bed. Most seats in business class have direct aisle access. I was seated in the middle row alongside another passenger, but despite not being in a solo seat, the center divider provided plenty of privacy. Each seat has ample storage, with either a foot-level cubby or a seat-level storage cabinet. When fully reclined, with a bed length of 6.5 feet and width of 22 inches, the seat provides ample room to get a good night’s rest. A long-haul flight is usually a period of tiresome drudgery to be endured, but the Aer Lingus flight was an enjoyable and restful experience. I would not hesitate to recommend upgrading to a seat in Aer Lingus’ business class. You’ll be rested and ready to kick-off your adventure but, trust me, you won’t be ready to get off the plane! 11 comments on "Review: A warm taste of Irish hospitality on Aer Lingus, an Alaska Global Partner"
I hear that there is a new bag size and weight limit. What are the regulations now for carry on and check baggage. Yes, I would like to know the answer to this question as well, when will we be able to use Alaska miles to book travel on Are Lingus? While we don’t have a specific date to share at this time, redeeming Mileage Plan miles on Aer Lingus is a top priority. We’re working hard to set this up and appreciate your patience. When will we be able to book Aer Lingus with Alaska Air miles? Will we ever be able to use Alaska miles to book travel on Aer Lingus? Yes, allowing our guests to redeem Mileage Plan miles on Aer Lingus is a top priority. We’re working hard to set this up and appreciate your patience. I flew Aer Lingus in 2003 when my husband and two friends and I were off to Scotland to hike the Drover’s Trail from Fort William to the Isle of Skye. We flew Aer Lingus from Seattle, with a layover at JFK. It was not a good experience. Whatever model the plane was, it reeked of old age. Ashtrays (!) in the seat handles, and one of our friends’ seats was semi-broken, plus the overhead light didn’t work. The flight attendants on board were oblivious to the tasks at hand, and spent more time chatting in the galley amongst each other then tending to passengers’ needs on this international flight. Afterwards, I discovered that many locals (Irish) refer to the airline as Aer Fungus. That said, not sure I’d fly with them again. But Alaska Airlines is still my favorite domestic carrier!